Estimating is an essential skill in maths and science and one that is actually threatened by the continued use of calculators and digital measuring instruments. Turn the tables and use the Line and Path measurement tools on Google Earth (click on the ruler on the top bar) to estimate distances and areas. Find a regular shaped feature on a map to start with – say a local football pitch – and ask pupils to measure it using the line and path function. From there they can go on to work out the area. Once they have got the hang of it, you can do all sorts of things. Find out how far they live from the school. If they walk to school, ask them to estimate the time it takes them and calculate how fast they walk. Use GE to get approximate measurements of local geographical features. 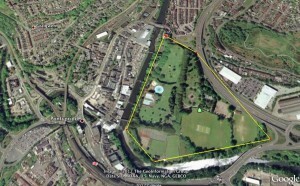 Use it to look at the ratio of green space to built up areas in a given area as part of an environmental project. Or calculate the amount of woodland or arable land. If they are old enough to be able to triangulate the shape then they should be able to calculate the shape just using the path function on GE to get the perimeter. Do the same thing with upper age secondary children using calculus! Find towns or cities covering the same area and check out whether their populations are different – suggest reasons why. Find out the length of the sides of a square that has an area of one hectare and one acre. Find a piece of land they are familiar with and draw a hectare and an acre side by side. Encourage them to visualize the relative sizes. Guess the number of hectares / acres of particular fields and check them out with the path and line function.